What is most important in hardware for your level of playing? I recommend more than 50 FPS. Test your FPS value on forge map (type in game: /map forge). 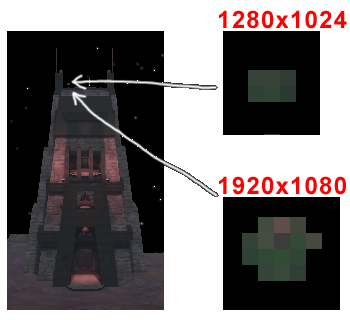 You can increase your FPS by turning off some effects (in game: main/options/gfx). Note. There is v-sync option that limits your FPS by vertical refresh frequency of your monitor. If this option is on, then your FPS will be in 60-120 range. We recommend to turn off this option (in game: main/options/display). Also, Sauerbraten has the max number of FPS. You can change it by /maxfps command up to 1000 FPS. Default value is 200 FPS. Buy any Razer or Logitech mouse. These mouses are used by profi gamers. Mouse is very important. We recommend use cable mouse Laser mouse with cable is best choice. Use monitor > 20". Hight resolution is important too. Look at following picture. Good mousepad provides smooth sliding of your mouse. Smooth sliding improve your aiming. - I recommend to set sensitivity as you can see on following picture. 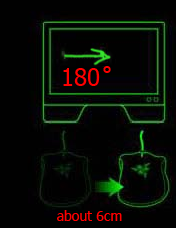 - Very good mouse optimization guide HERE! - Next very good mouse optimization and gameplay guide HERE! - Buy any Razer or Logitech mousepad. - Easier moving on mousepad is better to aim in game. - I recommend to play without hudgun, You can turn it off (type in game: /hudgun 0 or in game: main/options/game). Sometimes you cant see enemy behind your weapon, you will not see weapon (then you will recognize weapon by ammo icon) if you will turn off your hudgun. 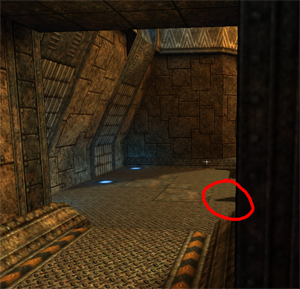 - Sometimes you can see enemy's shadow sooner than enemy's body, it can help to get ready shot. Look at following picture. - Its not so much important, if you will get fps<50, dont turn it on. - I recommend to change your crosshair. - You can find other crosshairs HERE. 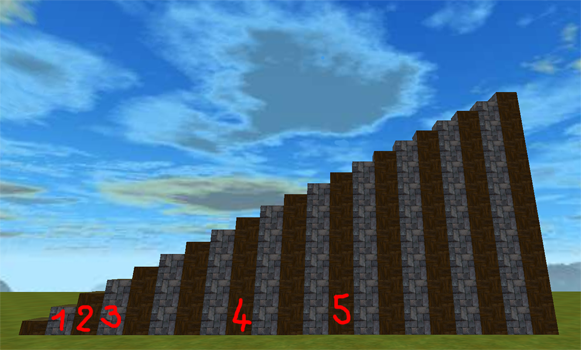 - You can change crosshairsize (type in game: /crosshairsize #) # = number (I use 12). Smaller crosshair = better snipe, but very small crosshair is bad (you dont see it very well on screen). 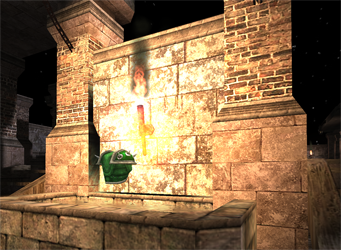 - Weapon-jumps are very important for playing. 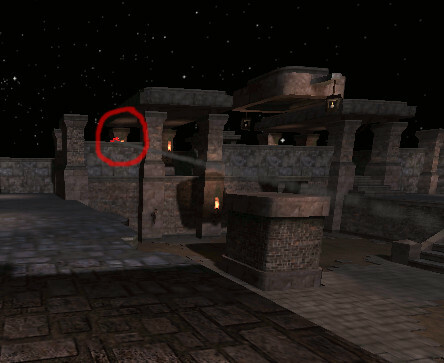 You can jump to some inapproachable places in map where are often quads or health boosts. - You can use all weapons (except fist). - You must shot under yourself together with pressing jump button. - On following picture you can see how much you can jump by all weapons. 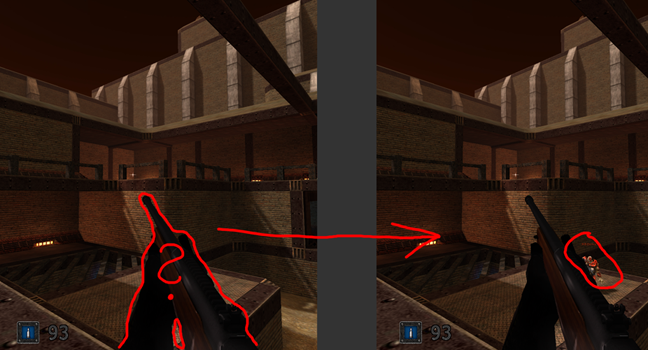 For example: With weapon-jumps I can easily get quad damage on complex map. - Look at following picture. You can see I would be injured if I will be takeing green armor. 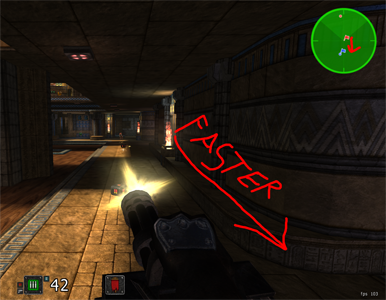 - Maxroll if default 2, but this is bad for playing, it is bad for aim when you are moving left to right. 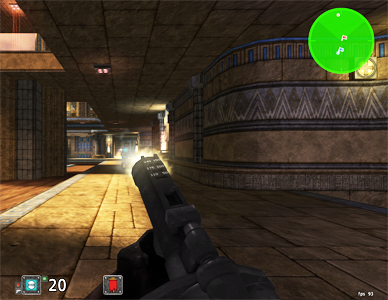 - You can run faster in game using some weapons, mainly rocket launcher and chaingun. - Its very useful in CTF mode. 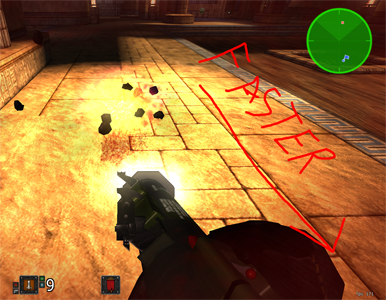 You MUST jump during the shoting by chaingun. You can shot enemy in same time. - Its very good defence in CTF mode, you shot granades behind your way. - Granade damage is about 64 in Trooper Edition! 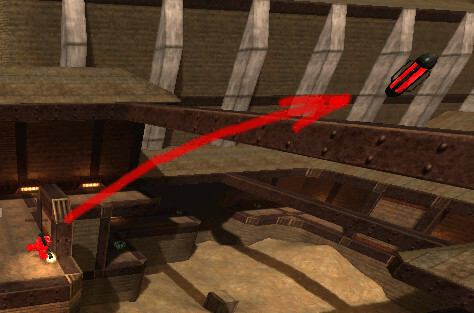 - If you doing jumpshots, enemy must be very fast to aim you, so it will give you good chance to be not killed. - Its combinations of using chaingun + rifle or rocket launcher or shotgun. - I will take time: Shot - 0,1sec - Shot - 0,1sec - Shot - 0,1sec - Shot (rifle) = 190 damage in 0,3 seconds! - You can aim much better and accurately. - Its better to use S E D F, why? Look at following picture. You can find buttons withouth looking on keyboard becouse you will feel dash or dot on F key. - 6 weapons (except fist) you can find in game. Music in Cube 2 is very aloud. I recommend to turn down your music volume (or mute) by command /soundvol (in game: menu/options/sound). You can hear sounds better now, you can hear enemy jumps or entering to teleports.